Transdermal drug delivery technology can provide advantages over conventional dosage forms, such as tablets, capsules and injections. Removing the TDS product from the skin can stop drug input and terminate the treatment if unexpected effects occur. Convenient patch delivery systems can be designed that incorporate anti-irritant ingredients and proprietary skin penetration enhancers. Weekly or twice weekly patch systems can provide sustained release and better compliance. A variety of thin, flexible, transparent and cosmetically aesthetic designs are available. Xel has developed proprietary once-a-week drug-in-adhesive transdermal matrix patches to deliver Huperzine A for the treatment of Alzheimer's Disease (XEL 001HP) and to deliver Bulleyaconitine for pain management (XEL 002BP). This system is characterized by the inclusion of the drug directly within the skin-contacting adhesive. The adhesive not only serves to affix the system to the skin, but also serves as the formulation foundation containing the drug and the excipients. This system is also incorporated directly into the adhesive. However, the multi-layer encompasses either the addition of a membrane between two distinct drug-in-adhesive layers or the addition of multiple drug-in-adhesive layers under a single backing film. This system has liquid compartment containing drug separated from the release liner by a semi-permeable membrane and adhesive. 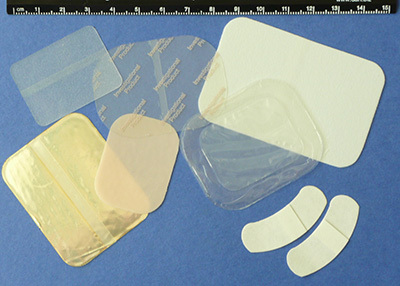 The adhesive component responsible for skin adhesion can either be incorporated as a continuous layer between the membrane and the release liner or in a concentric configuration around the membrane. This system has a semisolid matrix containing a drug solution or suspension in direct contact with the release liner. The component for skin adhesion is incorporated in an overlay and forms a concentric configuration around the semisolid matrix.